After a winter dominated by a lack of rain we here in Pelicanland viewed the approach of spring with a bit of trepidation, hoping that we were not to be immediately plunged back into a drought after last year’s super soaking pulled us out of one. The Miracle March has allayed our fears somewhat with a series of storms to bring up water levels to something approaching acceptable, although still well below normal. With spring set to begin Wednesday. March 20 we can look forward to the Weather Priestess settling into the relaxed California groove that she is well known for. We still need to pull through this weekend and the incoming pineapple express, though, so don’t put the galoshes* away just yet. * For those expats who have yet to Americanize, galoshes are wellies. Get with the program! The ending of winter inevitably brings forth change. The world is waking up from its long sleep as the days start to get longer than the nights. New life forces its way into these longer days and as such old life must give way. This is true not only in nature but in rugby as well, or at least in rugby reporting, as I have to give up old, cherished narratives and seek new topic sentences to extrapolate upon. Thus, it is with a heavy heart that I must say a fond farewell to the Narrative of the San Jose Seahawks, a team that fought and won against relegation to start the season with a series of 50 point blowout wins, only to get bored with that and win a series of games decided on the final play, and finally deciding that wasn’t fun enough so they played to a tie… decided on the final play. Previously I had written that “should they have a well managed 10 point win that might be the biggest shock of the season” so naturally… it happened. Much like my NCAA brackets this prediction was shot to hell. Goodbye old narrative, it was fun while it lasted. Last weekend was probably the busiest weekend of the year here in Pelicanland, so much that we had a number of referees from out of town fly, drive and train in to help cover games. Yet, when I downloaded the action from Whostheref I got only 14 match reports and 2 of them had no narrative so are listed with the score only and “No Report Received”. This is not how we should be doing things. Many people in the Northern California rugby community and beyond read this not for my commentary but for the match reports. They want to see how other teams are getting on. Shocking, I know, but true. Without the referee reports we do not, in fact, have a newsletter but… I shudder to think this… instead we have a blog. I don’t want to be a blogger. I have more self respect than that. Help me out. Write your reports. 1. Copy the link and have it available on your smartphone. If you have an iPhone add the link to your home screen. 2. When needed fill it out and click submit. The discipline chair of the competition you refereed will receive a notification about the incident. 3. He/she may contact you latter for more details. Army had a busy weekend and they fielded their second side. Maritime hosted senior day. Army was hard hitting and disciplined and Martime was up to the challenge. Army scored first but it wasn’t without some extra work to get across the line. At halftime the score was 3-22. Army would only score once more in the second half and Maritime didn’t stop working. Great game and the weather held out. Davis held off GCU for a while, but the hard hits and scrappy breakdowns were too much. GCU could get the ball out quicker and recycle faster. Breakdowns were contested from both sides and led to turnover ball. Davis didn’t stop fighting and they were rewarded with two scores. Teams were not disciplined and there were issues with repeat penalties from both sides. Great day for rugby, the field however was not in the best condition. Both teams played hard. I was impressed with the All Blues play. 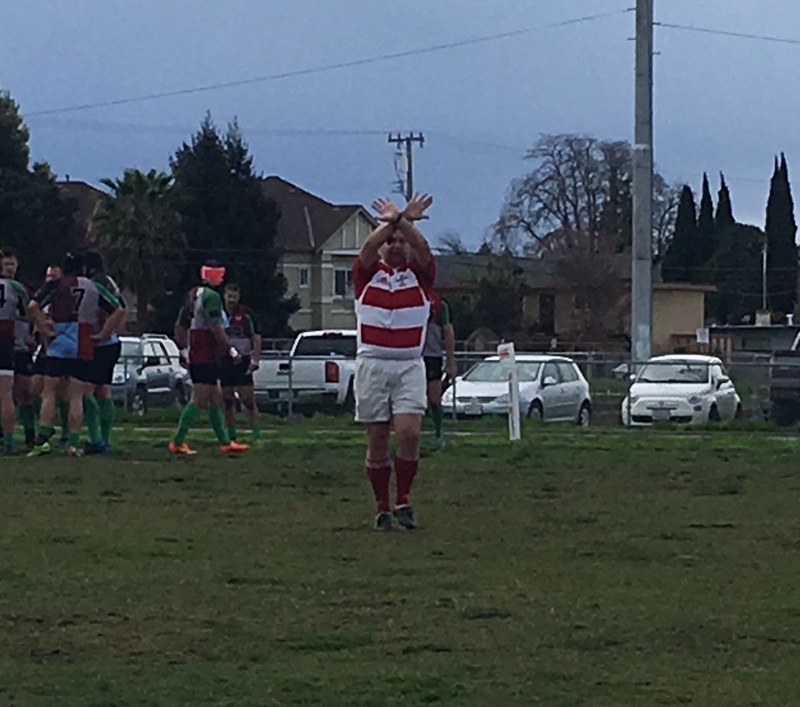 Santa Rosa scrum was not the best but we took our time and got through the day until they did not have any more subs so in the second half with 10 minutes left we went uncontested. With all the rain over the last few days, I was hesitant as to what the potential quality of the match was going to be. As I was driving to TI, there was a wall of water over Berkeley, but thankfully the game was rain free. Santa Rosa opened the scoring early into the match with a try and a conversion under the posts. SFGG responded shortly thereafter and dotted down a try of their own, but missed the conversion. Play continued back and forth until I awarded a yellow card to SFGG 14 for a no wrap tackle. However, GG was still able to add two tries before the end of the half. In the second half, GG continued to press their advantage and scored 3 more tries while Santa Rosa only managed 2 tries. Santa Rosa had limited numbers for the day, and the fatigue clearly showed toward the later stages of the game. GG was able to continuously make runs through their defensive line and gain 6 or more meters at the time. However, to Santa Rosa’s credit, they did have a great 80 meter run on the last play to score their final try. Competitive match with a real punch/counter punch feel. Vacaville started strongly with 3 unanswered tries. BA Baracus adhered to their game plan of taking the points when there were on offer and slotted 2 penalty goal to turn the tide. 3 BA tries followed for a 27-19 HT lead. Vacaville started the second half strongly with 2 tries in the first 10 minutes, including a length of the field, against the run of play try (by their very fast #7) from an errant BA pass. As the match wore on, Vacaville’s fitness seemed to gain the upper hand and they ran in several more tries. In the last 15 minutes, BA only managed a penalty kick and a mysterious drop goal by their Frenchman replacement who subsequently disappeared for the remainder of the match. FT 50 – 40 Vacaville. Clear day, a little chilly, 48 degrees at kick off. Central Coast scored 3 points at the two minute mark, Mendo quickly scored a try at the 5 minute mark. A very close game, Coast was up 15-10 at the half. Mendo scored in the first minute of the second half, both teams traded scores and Mendo pulled it off at the end, scoring a try at full time, winning 39-27. Fun game to ref and a great social after. Regarding Tech Zones. Sacramento did not have any subs. Their coach requested to film from an elevated position in the stands. It was not a worry to me and I confirmed with the Fog coach that he was also ok with it. Fog did keep its players and Coach in the Tech Zone. No complaints. Not sure what the official society policy is on it, but it worked for this game. As a Ref, I was fine with it and the coaches had no disputes at the field. Spent an enjoyable St. Patrick’s day refereeing SFGG V Oclub and then coaching Andrew Stockton. 1st half of the game saw some rather smash mouth rugby between both sides as they struggled with the offsides lines. With the first 20 minutes both teams had scored due to offside penalties called at mid-field coupled with good penalty kicks to touch and strong line outs. Seemed that the early penalties were effective as there were no more offsides issues called during the game. Prior to the intermission O Club found themselves up 17-15 and two SFGG players in the bin. 2nd half saw more enterprising play from both teams however SFGG were more effective in linking multiple-phase play and consistently making the gainline. Late in the game SFGG’s subs dictated the pace of the game. Final score SFGG 44, O Club 31. On a snowy day in Reno, Chico State travelled in harsh conditions to maintain their undefeated record. Accordingly, UNR agreed to a 30-minute delay to the kick-off. CSU arrived, warmed up and were ready to play so we actually kicked-off only 15 minutes late. There was about half a foot of snow on the pitch with more coming down, but the critical lines were all shoveled and easily visible. Running an offense was challenging, but UNR got on the board first with a converted try 9 minutes in. CSU answered back with an unconverted try in the corner about 8 minutes later. UNR earned another converted try at the 26 minute mark before the defenses took over the game. The sole remaining try was earned by UNR 28 minutes into the second half. Final: Reno 19-5. Rain kept the field location in flux until the day before. We ended up on a football field at Burbank High School. Upon arriving, there were soccer goals still on the field. Once we got those removed, and some cones put down for tech zones, we had a game. SFGG scored first with a penalty in front of their goal. Then CKM responded. The score was 17-14 at half but CKM pulled away. SFGG would only get another penalty while CKM used their speed and width to score in the corners. A lot of action – both teams showing excellent skill and speed in all phases. Granite Bay got to in-goal first; unfortunately the player kept going past the dead-ball line. After reorienting themselves to the goal line, Granite Bay came back minutes later with the first try. Lamorinda has a strong group of forwards but Granite Bay was too quick at getting the ball out of the loose for them to counter ruck. Lamo committed fewer players to the loose in the second half and was able to slow down the Granite Bay attack. Lamo had a pair of tries early in the second half and it looked like they might close the gap. Then Lamo found themselves down a player for a good chunk of the second half because of a sanction and couldn’t keep the comeback alive. A highly anticipated high school varsity match between Marin Highlanders and Solano-Yolo County turned out not to be the case on a very wet Saturday afternoon. Unfortunately Solo didn€™t have a full 15 so we declared a forfeit and Marin lent them some players to have a game. After all, we were here, wet and cold so might as well run around for a bit. Marin was the more organized and stronger side on the day. Not to say that there was no fight back from Solo, but the lack of subs and unfamiliarity of the lent players was a combination that could not be overcome. After about 10 minutes an injury to a Solo front row player led to uncontested scrums for the rest of the day freeing up both sides to concentrate on running, and run they did. The skill level of the U19 game continues to impress as both sides were well coached, with the difference being continuity of the Marin side. Excellent work from both captains kept this a fun game with no issues in spite of the scoreline. Preston Gordon signaling the end of my Winter Narrative. This entry was posted in News on March 21, 2018 by James Hinkin.